Sobha Developers' (www.sobhadevelopers.com) ad says that a duplex and a penthouse in Sobha Carnation (www.sobhacarnation.com) Kondhwa Pune gives you the pleasure of living in a bungalow and an apartment at the same time! In the last ad "2 Storey Stories", Sobha Carnation had focused on the 2 story structure of these duplexes and penthouses which offer privacy to your family members. In this ad Sobha talks about the pleasure of gardening, you can enjoy in the duplex and penthouse of Sobha Carnation. These are 'general benefits' of Duplexes and Penthouses. Aren't they? 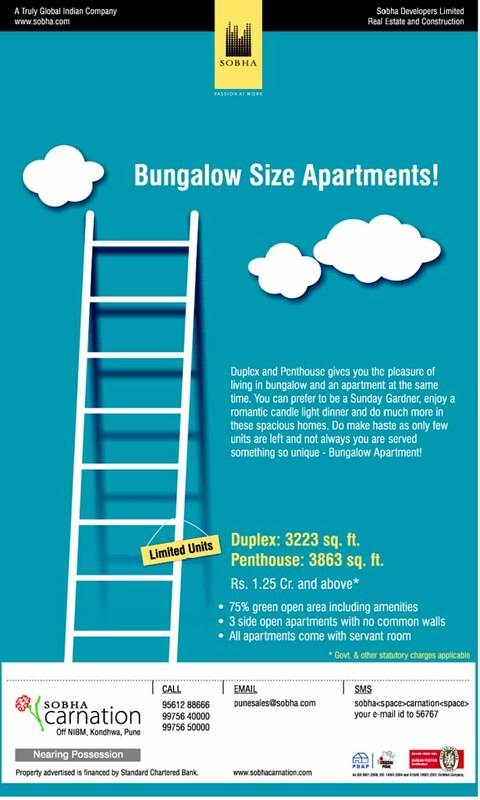 I would have liked to know "specifically" what i will get in a duplex / penthouse of Sobha Carnation. What about you?